Trolls and Hidden Folk are a part of daily life in Iceland. This collection of Icelandic folklore and legends comes from the days of the Vikings. The twenty-five short stories are centuries old and have been updated for today’s readers of all ages. 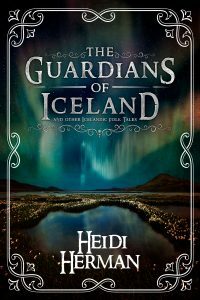 Children and adults alike will love to delve into this fantastic collection of traditional Icelandic fairy tales and legends. These short stories of trolls, elves with magical powers, and Hidden People have been passed down from generation to generation. First written down a hundreds of years ago, the stories are now brought together and updated for a modern audience, so now you too can read about the trolls who freely roamed Iceland, the race of Hidden People with strong magical powers and of the four powerful beings who still protect Iceland from invaders to this day. Packed full of fascinating myths, this collection of folklore is a must for anyone wanting to discover a world of mermaids and mermen, giants, shape-shifting seals and dragons in disguise. 2017 Book Excellence Award Winner for Multicultural Fiction. I wrote this book to share the unique folklore and mythology of Iceland with a new generation of readers. I have an Icelandic heritage and the outlook and lessons of the stories are very personal to me. Many of these tales have not been updated for hundreds of years and I wanted to bring a new life to these fantastic stories. The characters in these stories date back hundreds of years, some even as far back as the Viking days. Imagine reading a story that a Viking child heard back in the year 1100. Gryla the Ogre dates that far back! There once was a man named Unnar who lived in the southern town of Vik. One morning, he was walking on the beach, between the water’s edge and the towering cliff. It was very early, when the sun was just starting to peek over the horizon. As he walked, he came across a cave where he heard sounds of music and laughter, as if a great party were taking place. He drew closer and saw a huge pile of sealskins lying at the mouth of the cave. Looking around, Unnar quickly grabbed one of the skins, and then rushed home. He knew the owner of the sealskin would not be able to return to the sea without it. The creature would be caught in human form, completely dependent on the goodwill of others. Knowing all this, Unnar carefully wrapped the skin in several furs, then placed it at the bottom of a trunk and locked the trunk. He spent the day tending his livestock and doing his chores on the farm. With his work done, he walked back to the ocean and checked the cave he had found that morning. As he approached, he heard the sound of crying. He found a beautiful woman, wrapped in a plain cloak, sobbing. He knew this was the seal whose skin he had taken, but he pretended to know nothing. “What’s wrong, why are you sad?” he asked her, wondering what she might say. “I have lost something very valuable and cannot return home without it,” she sobbed.